With daily temperatures reaching 20°C, lakes warming up, and the faint hint of sun tans beginning to appear, this can only mean one thing… summer is coming. Despite Whistler Blackcomb boasting the longest ski season in North America, June 7th 2015 marks the end of an extended ski season in Whistler for many. However, this is not the case for those die-hard skiers and boarders that defy the stereotypical image of a summer spent laying out on the beach with a cold drink in hand. For those wanting to get their ski/ride fix while simultaneously working on their tan (or goggle tan, to be more exact), you’re in luck as glacier skiing atop Blackcomb Mountain opens this year on June 20th. While taking a look through our archive, I came across a 1980s video on summer glacier skiing on Whistler peak. 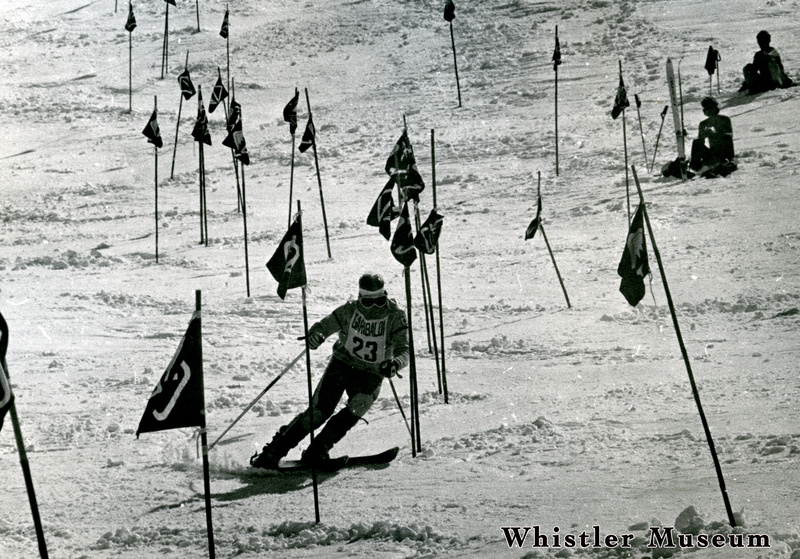 It would seem that “ski bums” have been finding ways to escape the bustle of the mountain base and extend their ski season into June and July since the inception of Whistler Mountain in 1965, even before the merging of Whistler and Blackcomb in 1997/98. If you thought the trek from the base to Blackcomb’s peak was extensive, involving a ride up two chairlifts, followed by a bus ride to the base of the 7th Heaven Express, this is rather a simple means of transportation compared to what those dedicated snow bunnies did to reach some summertime snow in the 1980s. 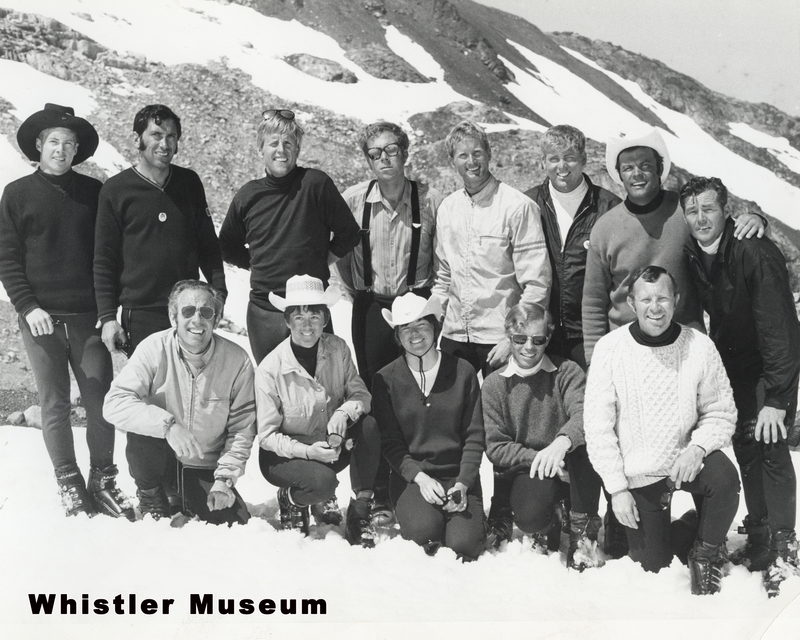 A photo of Toni Sailor’s Summer Ski Camp, 1969. Back row from left to right: Dan Irwin, Yves Benvene, Roddy Hebron, Andy Shall, Dag Aabye, Wayne Booth, Toni Sailor, Al Menzies. Front row from left to right: Alan White, Nancy Greene, Karen Dotta, Colin Haffrey, Roy Ferris. As the video reveals, the trek from Whistler base to its glacier used to involve a 45 minute ride up the chairlift, followed by a 20 minute hike at 6000 feet across the face of Whistler mountain. Unlike today, in which Horstman Glacier is open to anyone looking to get some T-shirt clad skiing and riding in, glacier skiing during this time of year was only available to those registered in a ski camp. With less time-consuming transportation routes to Blackcomb’s peak now in operation and the ever-growing popularity of Whistler Blackcomb, glacier skiing has gone from being exclusive to those that are very serious about the sport to being accessible by all. That being said, due to the vertical of the glacier, its terrain park features, and world-class race training facilities, it tends to draw a crowd of more advanced/expert skiers and riders. 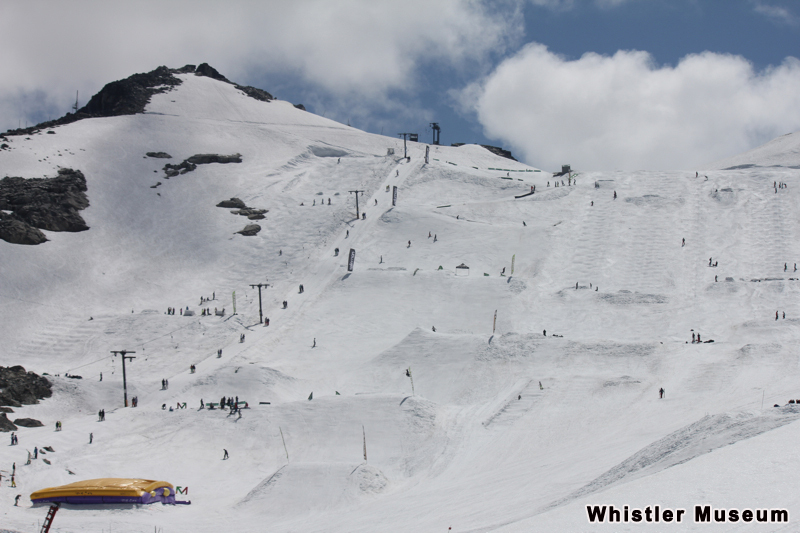 Regular operating hours for the Horstman Glacier are from 12:00 pm to 3:00pm daily, but for those that are eager to get a start on their summertime training, participating in one of Whistler’s many ski camps has its bonuses. These include earlier upload times and select private ski areas. Some of the more long-standing camps include the Camp of Champions, Treeline Summer Camps (formerly the Dave Murray Summer Ski and Snowboard Camp), and Momentum Ski Camp. While I remain strictly a winter skier, I find the dedication of those willing to challenge mother nature and look for a different way to spend their summer months to be inspiring. As a relatively new Whistler local, I am delighted to become a part of a community that simply loves skiing and snowboarding.